Notepad Printing - Print Custom Notepads Online at PrintFirm.com! Notepad Printing - PrintFirm.com provides custom notepad printing services online. It's FAST and EASY. Order today and SAVE! A company’s notepad may seem like a straightforward piece of paper without a function other than writing notes, but it can actually be an effective promotional tool. Occasionally, people take these notes home with them or B2B clients may bring them to the office. You have room on the notepad to list your company’s address and contact info. 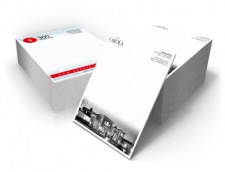 PrintFirm can help you achieve your notepad printing goals. 1-color and 2-color notepads are available in the following sizes: 3.5” X 8.5”, 4.25” X 5.5”, 5.5” X 8.5”, and 8.5” X 11”. Full color notepads are available in all of these sizes except the first one. 1-color and 2-color notepads are printed on 50 lb. offset paper, whereas full color notepads are printed on 70 lb. premium paper. You can design the notepad yourself by uploading any artwork and text to PrintFirm’s website. We accept popular file formats for notepad printing such as PDF, AI, JPEG, and TIFF. If nobody in your organization is skilled at graphic design, you can ask our talented team of graphic artists to design your notepad. You can still upload any company-specific logos or other graphics to our artists and they will incorporate them into the design. You can request an electronic proof of the design from our order page by clicking the check box. We will send you a PDF file showing the graphics and crop lines so that you can have a last chance to check the design before it is loaded into the printing machine. All uploaded images for notepad printing should have a resolution of at least 300 DPI (dots per inch). Lower resolutions may look fine on your computer screen, but when printed out the result is typically a blurry mess. Use caution when adapting images found online because they are generally low resolution. To check the DPI of a graphics file, open it in a reputable graphic design program and look at the file details. We recommend that you refrain from crowding your notepad with too much design. It should have even more whitespace than other printing products because its main function is to be written on with a pen or pencil. Moreover, any solid background color should not be too dark. That will reduce writing visibility. Allow for plenty of bleed space. Offset printing is more economical than digital printing, but it requires a margin of error during the cutting process. The allowance for that margin of error is known as bleed space. Extend your design about 1/8 of an inch past the notepad design borders. Don’t forget to include your company’s contact information such as the physical address, email address, and phone number. You may also want to include website info and social media details. Proofread the contact information carefully because one small mistake can be financially costly. No company can afford the reputation damage caused by a typo for something that is considered as a company’s main stationery. 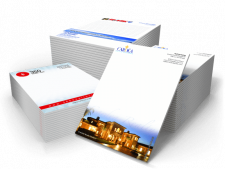 Please consider choosing PrintFirm for all your notepad printing needs. We believe that quality is just as important as giving discounts for quantity.